1996. The original members of Kiss reunite and don full makeup for the first time in 13 years. The computer called “Deep Blue” beats Garry Kasparov at chess. The Spice Girls release “Wannabe.” Fox News Channel is launched. “Braveheart” wins the top prize at the Oscars. The Ramones play their final show. Nintendo 64 is introduced. The Summer Olympics take place in Atlanta. Madonna gives birth to her first child. Bill Clinton is elected to his second presidential term. The bands Coldplay, Belle & Sebastian, Dropkick Murphys, Linkin Park, Queens of the Stone Age, and The Shins get their start. And Petal is formed in a Portland basement. Guitarist Ken Barton and bassist Mark Wyman had left their previous band, Suntribe, the year before, but they weren’t yet ready to hang up their instruments. They met vocalist Jessica Spiegel in her basement apartment in Portland to discuss the possibility of forming a new group. Drummer Rob Griner flew up from California to record what would become Petal’s debut CD, and the band’s first lineup was solidified. 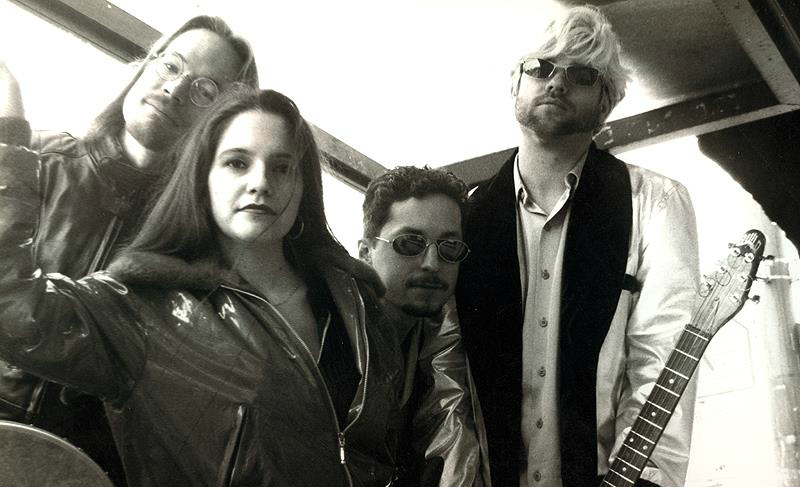 The foursome toured up and down the west coast, from the farthest reaches of northwest Washington to Los Angeles, for a few years before the schedule took its toll on Jessie, who was the first to quit the band in early 2000. Rob left soon after. Ken and Mark found another new singer and drummer, and Petal continued performing for another few years before that formation disbanded in 2001. Mark would go on to form The Trouble With Girls with Jen Nau, who now sings with The Frequence. Ken hung up his guitar in 2001 and didn’t pick it up again for 10 years, when he was enthusiastic enough about playing again that he began recording solo work. Fast-forward to the fall of 2012, when Mark sent a message out to all his musician friends asking if anyone wanted to get together now and then to play. Jessie and Ken, as it happened, were the only two who replied. The three started practicing once a week, revising their nearly-20-year-old songs for a trio – Mark on acoustic guitar, Ken on electric guitar, and Jessie singing. Being older, wiser, and less convinced that they’re going to be rock stars means playing music now is all about having fun. The trio is currently dipping its collective toes into recording again and playing occasional shows in the Portland area. In between shows, they alternately entertain and bore the cats in the living room practice space.